Greetings again from the darkness. How do we handle challenges to historical achievements that have been accepted as facts for more than a millennium? Film classes have long taught that Thomas Edison and the Lumiere brothers were the pioneers of moving pictures. Director David Nicholas Wilkinson has worked for 33 years to prove that Louis LePrince actually beat them to the punch with his own camera and “movies” produced in 1888 Leeds. When LePrince mysteriously disappeared in 1890 he became the industry’s first tragedy/mystery, leaving him with no place in history … something Wilkinson is trying to correct. You may have heard other arguments for Eadweard Muybridge, William Friese-Greene and Wordsworth Donisthorpe, but it comes down to limiting the definition to a single lens camera capturing live action on film for playback. Director Wilkinson includes the 3 surviving snippets of scenes recorded by LePrince: a small gathering of friends/family walking around, LePrince’s son Adolphe playing an instrument, and a Leeds street shot of moving carriages. To prove his theory and secure LePrince’s place in history, Mr. Wilkinson meets with film historians, researchers, academic experts, museum curators, and even a patent lawyer. The patents are key because LePrince had secured his U.S. and England patents, but the laws worked against him and his supporters once he disappeared. Details are presented in all aspects … some concrete, scientific and impressive; others more speculative and circumstantial (as you would expect 125 years later). Wilkinson is willing to do what’s necessary to make a clear point as evidenced by his searching a graveyard for a specific headstone (to establish a timeline of the “walking” footage). Two of the more interesting sequences occur when Wilkinson visits the actual room in the oldest house in Manhattan where LePrince’s moving picture was to be shown; and his trip to Memphis, Tennessee to meet with LePrince’s great great granddaughter to share evidence, artifacts and stories. The three main theories surrounding LePrince’s disappearance are profiled. Was he murdered (possibly a hit by Edison)? Did he commit suicide? Was it all a plot to steal his patents? 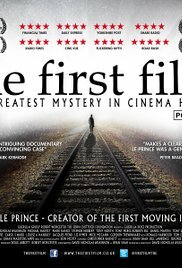 With no body, no witnesses and no evidence of a crime, the LePrince disappearance is the first unsolved mystery of the movie business. It seems Wilkinson presents enough hard evidence to justify adding LePrince into the discussions around the birth of movie making. The unsolved mystery adds an element of intrigue, and makes for a more interesting movie. Mostly Wilkinson is to be admired for his 33 year obsession, for finishing his project, and for bringing attention to one of history’s forgotten players. Beyond that, the tongue-in-cheek manner in which he chooses to end his film allows us to appreciate his efforts and keep it in perspective. This entry was posted on Monday, September 19th, 2016 at 11:48 pm and is filed under Documentary. You can follow any responses to this entry through the RSS 2.0 feed. You can leave a response, or trackback from your own site.